Most basements have been constructed with a concrete slab floor. Occasionally, basement floor cracks will develop, causing the slab to separate and look unsightly. The common misconception among many homeowners is that these cracks have resulted from defects that occurred during the construction process. A more cynical explanation of this is that concrete slabs are classified into two categories – those that are cracked already and those that will eventually crack. How active is the crack in your basement floor (in other words, does it appear to be growing)? How large is the crack (horizontally and vertically, i.e. length and depth)? Where is the crack located (is it running across the floor or where the floor and wall meet)? Answering these questions will help you determine the best way to approach them and make repairs. Cracks in a basement floor is more cosmetic in nature than anything else. This means that the cost to repair them will usually exceed the benefit of making the repairs. 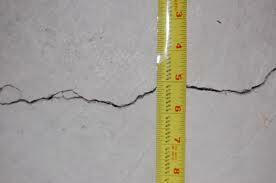 Additionally, it is not uncommon or unreasonable to see minor cracks developing in concrete flooring slabs. Freezing and thawing – if you live in a region where hard frosts are common and the ground stays frozen for long periods of time, your basement floor could start developing cracks. This is due to the fact that expansion occurs as the ground freezes and then contracts once it thaws out. This expansion and contraction will cause the concrete slab to shift slightly, eventually putting enough pressure on the slab, causing it to crack and split. The process is much quicker in areas of extreme temperature ranges. Improper thickness – if the contractor who poured the concrete when the home was being built did not pour enough to achieve the required thickness or installed it improperly, there is a much greater risk that basement floor cracks will develop. In most areas, the required thickness is a minimum of 4 inches. Additionally, rebar or reinforcing wire should be used when the slab is being poured. Settling – one of the more common causes for the development of cracks in a basement floor is the settling of the slab that occurs over time. The slab’s weight causes the ground beneath it to compact as it settles. If one section of the slab settles deeper or faster than other areas, the concrete will eventually crack. Uneven weight distribution – depending on what the intended use of your basement is, the slab can start to crack due to uneven weight distribution. In other words, if it is a frequently used living area, you may have installed heavy pieces of furniture, a hot tub, or a pool table. These heavy items cause an imbalance in weight distribution which can cause cracks to develop over time. Water – in many cases, water acts in similar fashion to settling especially if there is an excessive build-up of it beneath the concrete slab. The slab will start to sink, causing it to be uneven in those areas where the water has accumulated and the ground remains fairly moist. This unevenness in the flooring causes tension and when the weight of the slab becomes too severe, breakage and cracking will occur.